Were the 4 Gaza Boys Intentionally Targeted by Israeli Missiles? On Wednesday, July 16, 2014, the Israeli military dropped bombs that hit a shack located on a Gaza beach. The first blast had killed one child. A group of children were seen running away from the area of the first blast, headed towards a nearby hotel that was filled with journalists. The beach was empty except for the running children. The running children were visible, even from a distance, to the many journalists at the hotel. As the children ran, a second round of firing began in their direction - an ensuing third blast then killed three children. This third blast was a mere 30 seconds from the first blast. Some others made it to safety - four amongst the survivors were injured with shrapnel wounds to their head, chest and limbs. Since this tragic occurrence unfolded in front of many international journalists, let us see what was reported about it, and if there were any differences or inconsistencies in their accounts. The main points in the eyewitness accounts and news reports are highlighted in red. A small shack atop a sea wall at the fishing port had been struck by an Israeli bomb or missile and was burning. A young boy emerged from the smoke, running toward the adjacent beach. I grabbed my cameras and was putting on body armor and a helmet when, about 30 seconds after the first blast, there was another. The boy I had seen running was now dead, lying motionless in the sand, along with three other boys who had been playing there. There is no safe place in Gaza right now. Bombs can land at any time, anywhere. A small metal shack with no electricity or running water on a jetty in the blazing seaside sun does not seem like the kind of place frequented by Hamas militants, the Israel Defense Forces’ intended targets. Children, maybe four feet tall, dressed in summer clothes, running from an explosion, don’t fit the description of Hamas fighters, either. The four Bakr boys were young cousins, the children of Gaza fishermen who had ordered them to stay indoors — and especially away from the beach. But cooped up for nine days during Israeli bombardments, the children defied their parents and went out Wednesday afternoon, the eldest shooing away his little brother, telling him it was too dangerous. As they played on and around a jetty in the late-afternoon sun, a blast hit a nearby shack. One boy was killed instantly. The others ran. There was a second blast, and three more bodies littered the sand. One was charred, missing a leg, and another lay motionless, his curly head intact, his legs splayed at unnatural angles. No doubt that whoever undertook the first strike, could most likely see that, well, whoever was running away from the point of impact were children. This coming from a source in Israel, very close to the military, who deems again that whoever was operating the machinery on the Israeli end could see that these were children. I had just returned to the hotel to type up some notes and file inserts on the day’s news when there was a large explosion on the quay at the port, a little after 4 o' clock in the afternoon. 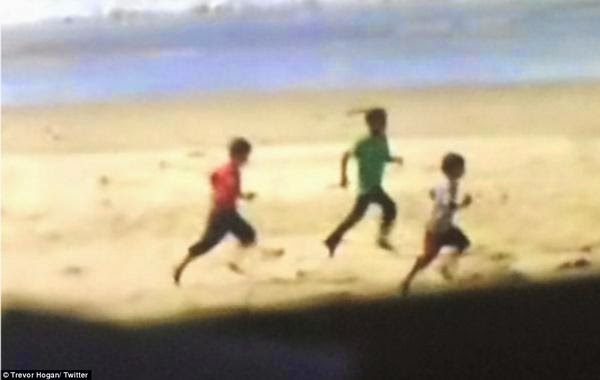 Four young boys – members of the same family – playing football and hide and seek on the beach were killed today by what is believed to have been gunfire from Israeli warships carrying out a blockade of Gaza. The attack on the fishing port in Gaza City came at just after four o’clock on a sunny and clear afternoon with good visibility. The group of cousins, aged between nine and 11, were around what looked like a derelict shed when they were hit by a shell from the direction of the sea. Nine days of violence has cost 213 lives and led to more than 1,200 injuries in Gaza. The overwhelming number of civilian dead, including children, have come from air strikes. The Israeli military have, however, repeatedly targeted the port, destroying a number of buildings as well as vessels. The fishermen who are based there strenuously deny that any arms, including rocket launchers have been based there. The first projectile hit the sea wall of Gaza City's little harbour just after four o'clock. As the smoke from the explosion thinned, four figures could be seen running, ragged silhouettes, legs pumping furiously along the wall. Even from a distance of 200 metres, it was obvious that three of them were children. Jumping off the harbour wall, they turned on to the beach, attempting to cross the short distance to the safety of the Al-Deira hotel, base for many of the journalists covering the Gaza conflict. They waved and shouted at the watching journalists as they passed a little collection of brightly coloured beach tents, used by bathers in peacetime. It was there that the second shell hit the beach, those firing apparently adjusting their fire to target the fleeing survivors. As it exploded, journalists standing by the terrace wall shouted: "They are only children." In the space of 40 seconds, four boys who had been playing hide and seek among fishermen's shacks on the wall were dead. Beaumont, who has been in Gaza for the last nine days, said that during the time he has been at the hotel, that area of the harbor has been hit by the IDF "at least three times." The IDF Spokesperson unit had difficulty coming up with an explanation for the explosions which killed the four children and wounded others and it took a few hours for them to begin to respond. Toward 8 P.M they began briefing reporters that the first explosion was most likely caused by an attack on a "legitimate" Hamas target and the second the result of misidentification of the fleeing children as Hamas fighters. The incident is still under investigation, said IDF Spokesperson Brigadier General Moti Almoz. He said on Channel One that "we understand there was a target which was hit after suspects were identified. Remember that Hamas uses civilians as live targets opposite IDF. I don't know officers and soldiers who intentionally act against civilians." Almoz said that from what the IDF knows so far "this wasn't fire by the navy but likely an IAF strike." Beaumont says that he has no idea what the target could have been. "The building that was hit was just a shipping container next to where one of the kids' father keeps his boat and stores fishing nets. The kids were just playing hide and seek there. They shoot missiles (against Israel) from this neighborhood but none from that location." Al Jazeera's Dekker, who was at the scene when the incident happened, said she had seen no evidence of Hamas targets in the area. 1) The Gaza harbor has been targeted at least three times by the Israeli military. 2) None of the previous bombings had ever reached as close as it did on July 16, 2014. 3) No evidence of Hamas targets in the area. 4) The shack on the beach that was targeted was an old decrepit building that did not have running water and electricity. It was used as a place for storing fish nets by the fishermen. 5) Children were known to often play on the beach. In fact, journalists reported being familiar with some of the fishermen's children who played on the beach. 6) It was a clear day with good visibility. Journalists who were at a distance could easily make out the running figures to be children. 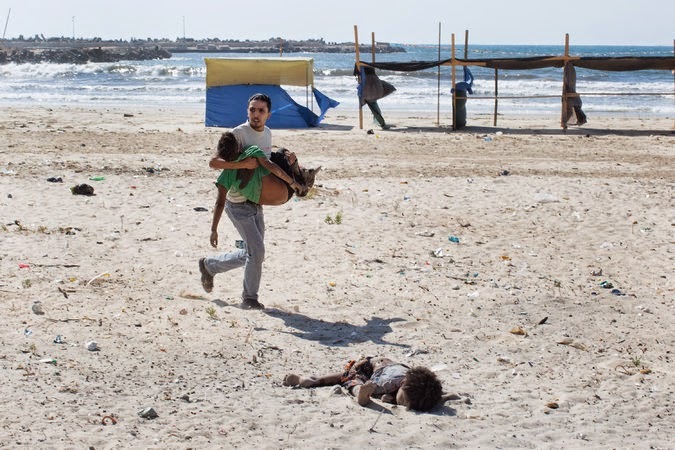 With approximately a dozen international journalists witnessing this tragic event from a few feet away, the Israeli military aimed their weapons at unarmed children between 9 and 10 years old while they were playing in the beach. Interestingly, the hotel which was known to host international journalists and which was located just a few feet away was not targeted by the Israeli military. So if the Israeli military's intent was not to kill the children, the eyes of the Israeli military (or to be precise, whoever was operating the artillery machines) may have been momentarily blinded so as to see something that no one else at the scene could - i.e. Hamas militants instead of children running away.